MINNEAPOLIS – Maya Moore was pulling up from all over the floor. Sylvia Fowles and Rebekkah Brunson were patrolling the paint. Lindsay Whalen was spearheading the effort on both ends. The bench brigade brought a spark. And the Target Center was roaring. 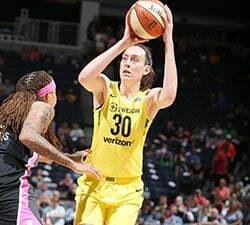 But even after building a 14-point first half lead, the defending champs didn’t quite feel whole in these WNBA Finals until “Money ‘Mone” got cooking. With the home team’s lead trimmed from as many as 17 to six less than a minute into the fourth quarter, Seimone Augustus caught the ball on the left wing, took two dribbles toward the basket, absorbed a bump from Sparks defender Chelsea Gray and dropped a right-handed floater into the hoop as she fell to the floor. When Augustus popped back up onto her feet, Moore – clapping and pumping her fist from the bench – saw a familiar sight. Money ‘Mone was back, and with that, the backs-against-the-wall Minnesota Lynx looked like the three-time champion Minnesota Lynx again. After all, she was the one who arrived as the first piece of the Lynx dynasty. Landing the No. 1 pick and drafting Moore in 2011 — following another losing season plagued by an injury to Augustus — transformed the franchise. 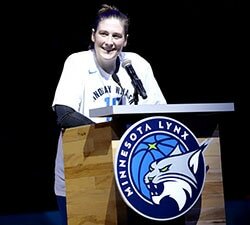 But a decade after the Lynx drafted Augustus first overall in 2006, she remains the team’s heartbeat and its veteran voice in the locker room. It’s her, not Moore, introduced last when starting lineups are announced at home games. With the Target Center tense to start the fourth quarter, at last, Augustus went into what Reeve called “bayou mode” – a nod to ‘Mone’s days as a Baton Rouge, La., high school and college sensation. “I don’t know what happened,” Reeve said. “We always kind of wonder what happened in the game that kind of got her going. I knew it wasn’t going to be me. I told her I’m done trying to get her going. We’re both too old for that. One minute, 18 seconds after the driving and-one from the left side came a dribble hand-off from Brunson that led to a driving and-one from the right side. Augustus clenched her fists, yelled to herself, pounded her chest and bobbed her head again. Fifty-four seconds later, she cut into the paint and turned a feed from Fowles into an easy lay-in. 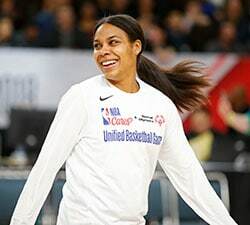 The Lynx lead was back to a commanding 12, and ‘Mone had 14 points – passing Diana Taurasi for second all-time in career WNBA Finals scoring in the process. Moore finding enough breathing room to score 21 points on 8-of-16 shooting helped knot the series before it shifts west. Fowles showing her own mean streak en route to 13 points and 15 rebounds – leading a 46-32 overall rebounding advantage – proved pivotal. Clogging L.A.’s free-flowing offense to the tune of 33% shooting did, too. But the Lynx weren’t the Lynx until Seimone Augustus was Money ‘Mone, breathing life back into another championship chase.